Previewing is a great way to see the changes you've made to your Articulate Storyline course without actually publishing. Press F12 on your keyboard. 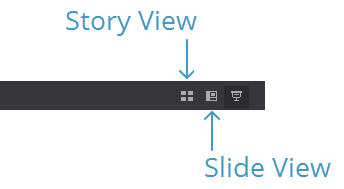 Click the Preview button on any tab of the Storyline ribbon. Click the Preview icon in the lower right corner of the Storyline window. Press Ctrl+F12 to preview the current slide. Press Shift+F12 to preview the current scene. 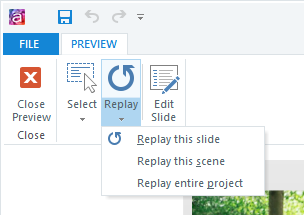 Click the Preview drop-down arrow on any tab of the Storyline ribbon, then choose to preview the current slide, the current scene, or the whole course. Use the buttons on the Preview ribbon to do any of the following. Close Preview: This closes the Preview window and takes you back to wherever you were prior to previewing. Select: This lets you preview a different slide in your course. Replay: Click this button to replay the preview again. To preview a different portion of the course, click the drop-down arrow and choose one of the available options. Edit Slide: This takes you to Slide View of the slide you're currently previewing. You can also use the buttons in the lower right corner to close the preview and jump to Story View or Slide View. Hyperlinks may not work during preview. We recommend publishing to test hyperlinks.